All interior paint jobs are not created equal. Your Interior Paint Job is not the same as your neighbors. Some painters are prepared to apply whatever color you choose to your walls. Exceptional painters, however, are ready to do far more. When you turn to an Ann Arbor painter for the interior painting of your home, you already know how much effort painting takes. Sure, you could do the job yourself, but you want an expert to get the job done. Outsourcing saves you time and delivers an excellent final product. Basic prep. Depending on the condition of your walls, interior painting prep can involve various tasks. If you have wallpaper and need it removed, that also means the backing and glue must be thoroughly eliminated too. Furniture will be moved from the work area and covered with drop cloths, as needed, to reduce the accumulation of drywall dust or any errant paint drops. Detailed prep. If your walls have been painted multiple times, or if you are moving into a pre-owned home with no knowledge of its painting history, there are likely to be bumps, patches, and drips that have interrupted a smooth paint job. In cases like this, careful sanding should be done until the walls are smooth and even. Without a flawless foundation, there will not be a flawlessly painted wall. Small repairs are almost always necessary before walls are painted. In some cases, large repairs must be done as well. An expert painter repairs, replaces, or patches drywall that has been damaged by door knob holes, water stains, nail pops, wall glue, or loose drywall tape. Professional painters don’t always use painter’s tape – that’s because they’re so good at what they do. They can get in the corners and along edges without leaving paint spots behind on ceilings, trim, carpet, or flooring. Meticulous painting efforts make all the difference between a superior paint job and a mediocre paint job. Even elements like matching-color caulking applied to trim affects the final appearance of your freshly painted area. Your home will only look as good as what your Ann Arbor painter leaves behind – that not only includes the paint job, but an effective cleanup job. Along with returning furniture and other items to their original locations, the work area should be vacuumed and all trash relating to the job completely removed. In short, your painter ideally leaves behind nothing but revitalized and professionally painted walls. 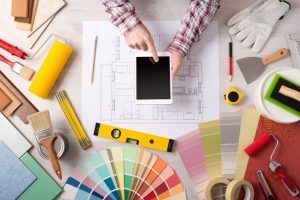 Any interior painting job – whether you have nine-foot high ceilings or intimate spaces, one room or an entire floor of vacant condos – requires attention to detail, a practiced hand, and, sometimes, major efficiency. Homes are put on the market every day, sometimes with little time for staging. Renters move out and any delay in turnaround time is money. A paint job can be done quickly to completely revitalize a space, brighten it, and make it look cleaner. To get the kind of results that will make your walls look great in a short amount of time, you want to hire an expert painter in Ann Arbor with the experience and capability to deliver, no matter your timeline. Hire an experienced painter who can offer all of the above, while also providing suggestions and advice about painting to simplify and clarify your choices. Contact Fine Line Painting, Ann Arbor painter, to discuss the interior paint job you need to have completed.